The wedding photography timeline is going to set the tone for your wedding. So establishing a smooth flow is extremely important. Below I’ve created a fairly comprehensive list of recommendations that I give to all of my clients. I believe they make a wedding day photography timeline run effortlessly. This post is quite extensive but I promise you that you’ll feel like a wedding planning pro after reading this. I’ve also included a hypothetical summertime timeline at the end. This timeline will not necessarily apply to all weddings. Listing definitive schedules for every wedding is really a futile task, as all weddings have special considerations. The intent of the schedule and suggestions is to bring attention to the aspects that are important when constructing a photography timeline. They illustrate time that I recommend dedicating to each part of the day. However, there are elements included that may not apply to your wedding. 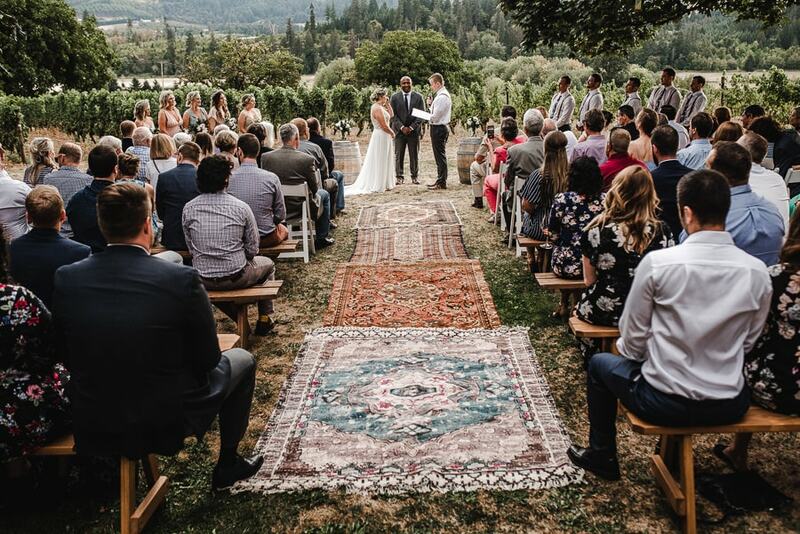 Your ceremony start time could be different depending on the time of year. You may not have a wedding party. Maybe you’d prefer to skip doing a first look. Or perhaps you’ve planned something out of the ordinary. All of that is groovy in my book, so adjustments would be made. The photography timeline should also not be confused with your planners day-of timeline. Your planner’s timeline will not only incorporate the photography timeline but the timing of all the moving parts of your wedding. 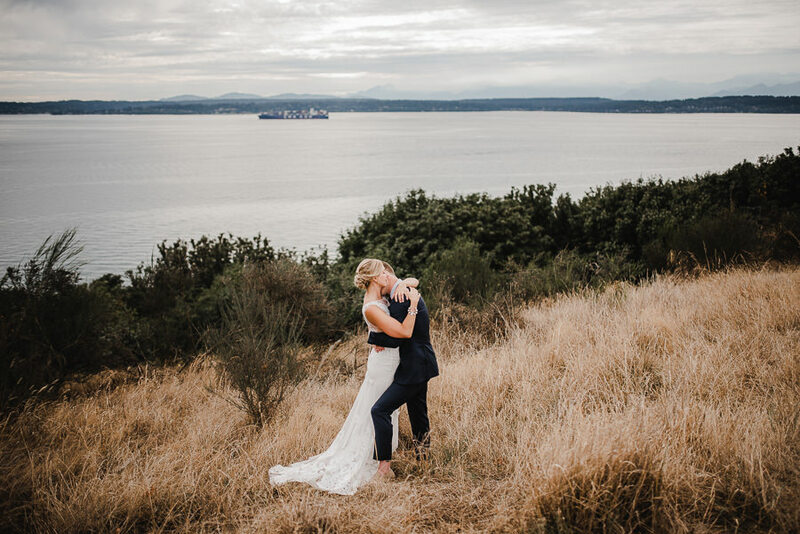 I recommend consulting with your photographer before nailing down things with your planner. 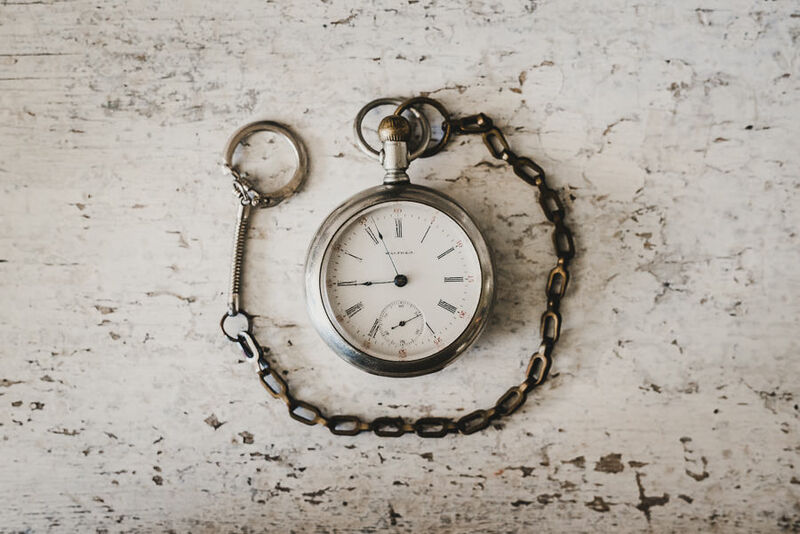 If the photography timeline is incorporated as an afterthought then it may be too late to implement adjustments recommended by your photographer. These recommendations are strictly based on my own personal approach that has developed over nearly a decade of photographing weddings. I highly value cultivating a relaxed flow and vibe for my couples. To facilitate this, my schedules generally fall within the 8-12 hour range for full coverage. This admittedly does require a substantial investment, and it’s a premium experience. But I want nothing less for my couples on their wedding of all days. Every photographer will have slightly different time suggestions and methods based on how they shoot. So be sure to consult with your unique photographer when you get to that stage. I start here because I often notice a gap between public perception of the time it takes to document a wedding and the amount of time a photographer actually needs to deliver unique, creative artwork. 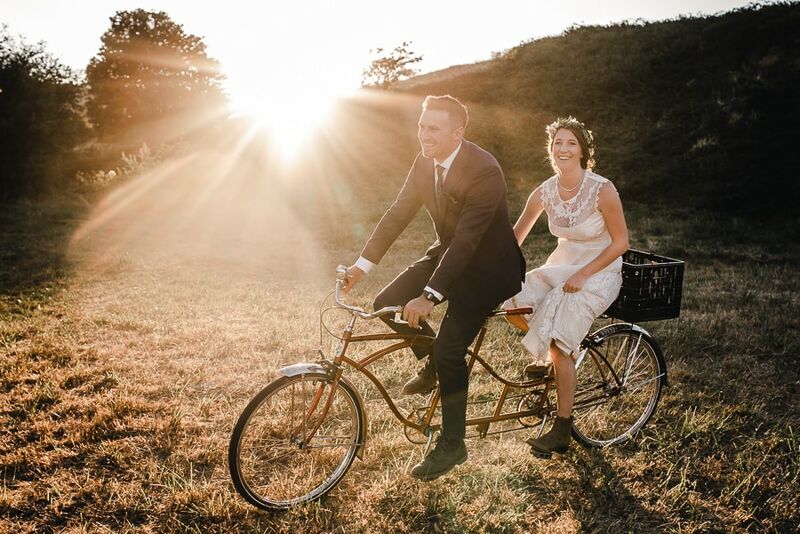 More importantly, I also find that many couples underestimate the amount of time that they personally need to experience their wedding in a relaxed way that allows them to feel present and in the moment. Rushing the photography is also rushing yourself. You do not want to feel rushed on your wedding day, and if you instruct your photographer to cram too much into an insufficient amount of time it has the potential to create an unpleasant experience. 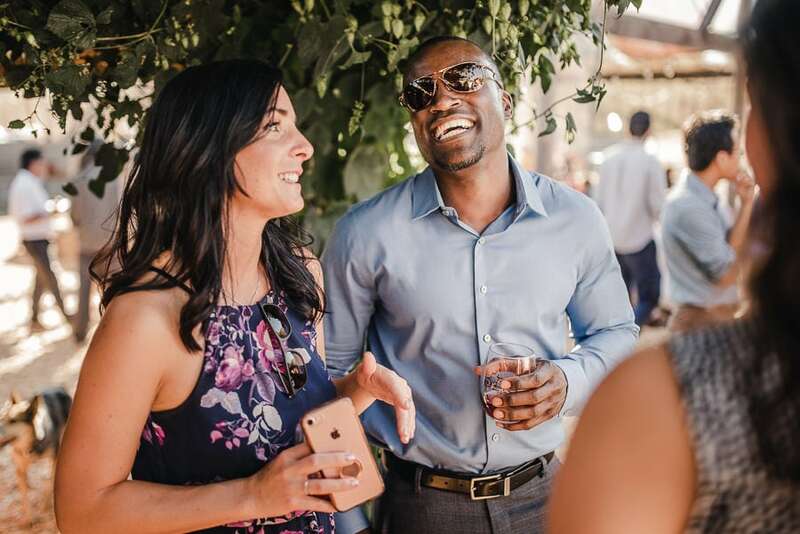 In an attempt to cover everything, your photographer could end up rushing your wedding party along because they’ve been placed in a difficult position time-wise. If you’ve selected a photographer you love, I highly encourage taking their recommendations to heart so they have the time they need to deliver the images they advertise, and so you have the best experience possible. Transportation time is often overlooked when planning a timeline. If your wedding is taking place entirely at one location then this is, of course, less of a concern. But when we talk about transport time this means more than just the time it takes to drive between point A and B as indicated by Google Maps. We also want to account for possible traffic, finding a parking space, loading and unloading, etc. My general rule for transport time is to add 15-20 minutes to the total drive time. Transport time is not to be confused with buffer time, which I cover below. The two should not be combined, as it will defeat the purpose of having a buffer. Let’s be really honest, rarely do weddings go completely as planned. Usually if something does go wrong it’s minor, but there are so many moving parts at a wedding that something is bound to happen. I’ve had groomsmen forget their pants. I’ve had a bride who discovered the holes in her ears had closed, so we had to help re-pierce her ears last minute. I’ve had parents get into a fender bender on the way to picking up the groom. I’ve had a bride’s car battery die on the way to the venue. Vendors can run late. Weather doesn’t always cooperate. Due to the unpredictability of weddings, it’s always smart to plan for the unexpected. I like to incorporate buffers in two key places. The first one is just after getting ready. I find that the most likely time bottleneck occurs between getting ready and the first look. Couples generally tend to run 10-20 minutes behind schedule, sometimes longer, when trying to get out the door. This can end up eating into the investment made into portrait time, or guests are made to wait around at the ceremony location. For this reason, I like to insert a 30-minute buffer after getting ready. This accounts for the general tendency to run a tad behind schedule and any other freak occurrences. The second 30-minute buffer is placed after portraits right before the ceremony. 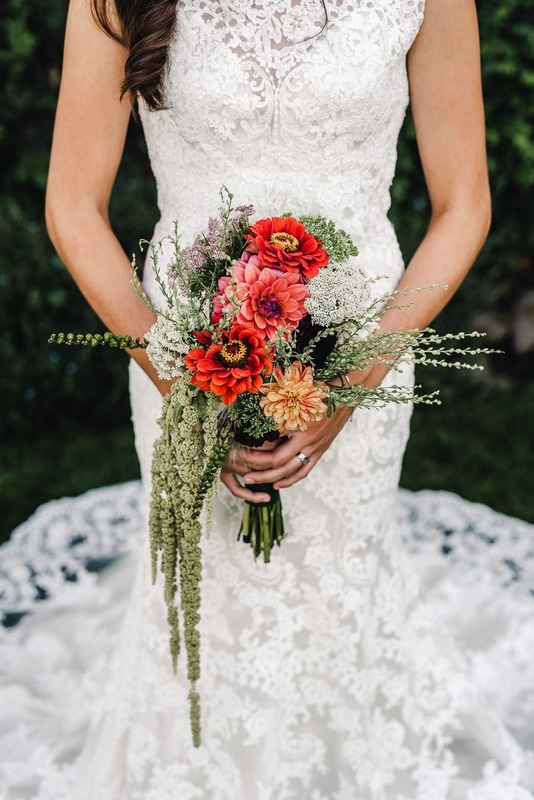 This gives time for the couple to get hidden away before guests arrive, get a drink of water, touch up their makeup, or use the restroom before the ceremony kicks off. Meanwhile, the photographers are given an opportunity to photograph the ceremony and reception details as well as guests greeting each other. If for some reason a significant event occurs that causes the schedule to fall way behind, then a full hour between the two buffers is available to absorb any time lags. This does happen from time to time. Since I started encouraging couples to utilize these buffers, rarely do I ever have a wedding schedule run late. The first look is a newer tradition that has become more popular over the past 15 to 20 years. More couples are opting for a first look so that they can take the majority of the portraits before the ceremony. 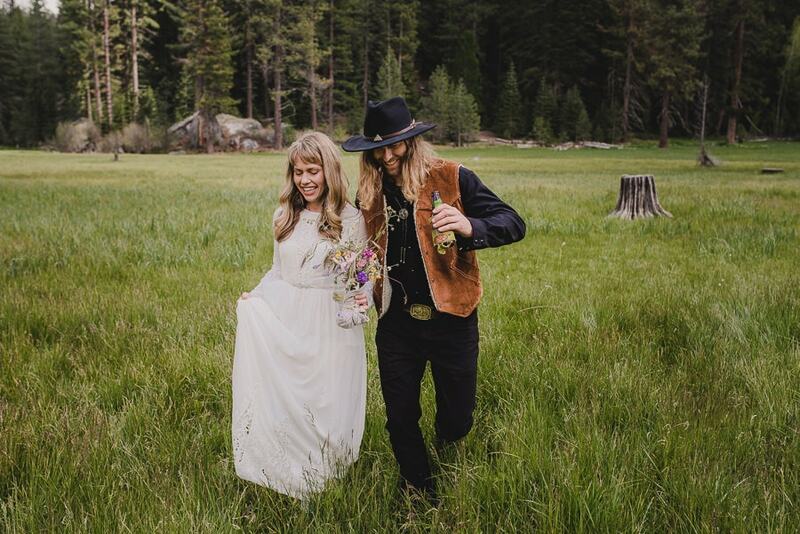 For those unfamiliar with the first look tradition, it begins just before portraits and provides a special opportunity for the bride and groom to see each other all dressed up for the first time. The intention is to supplement the walking down the aisle experience. It can be very emotional and makes for great images. Back in the day, the majority of weddings were a bit more traditional with a church ceremony and a reception held at a separate venue. In this situation, there was a natural transition time between locations during which portraits could be taken. 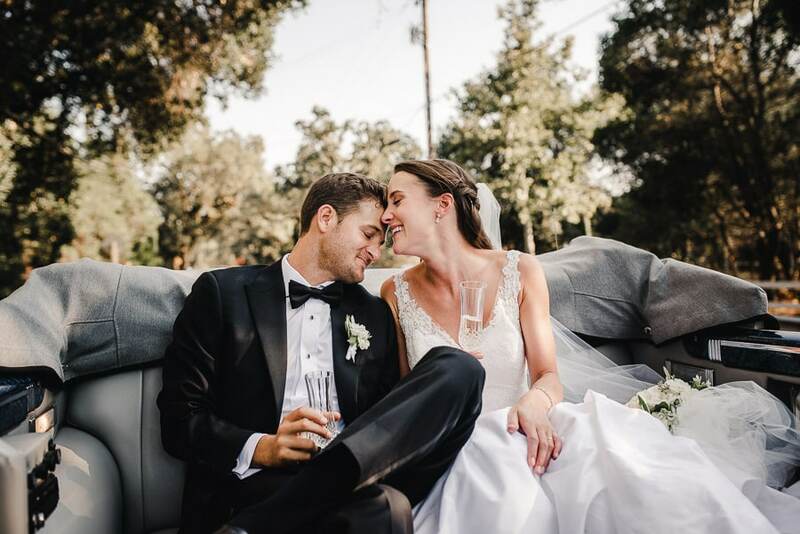 Nowadays, couples are trending toward holding their wedding at one location, and many couples would like to join in for part of cocktail hour. This makes it often impractical to take all of the portraits between the ceremony and reception. Hence the first look. 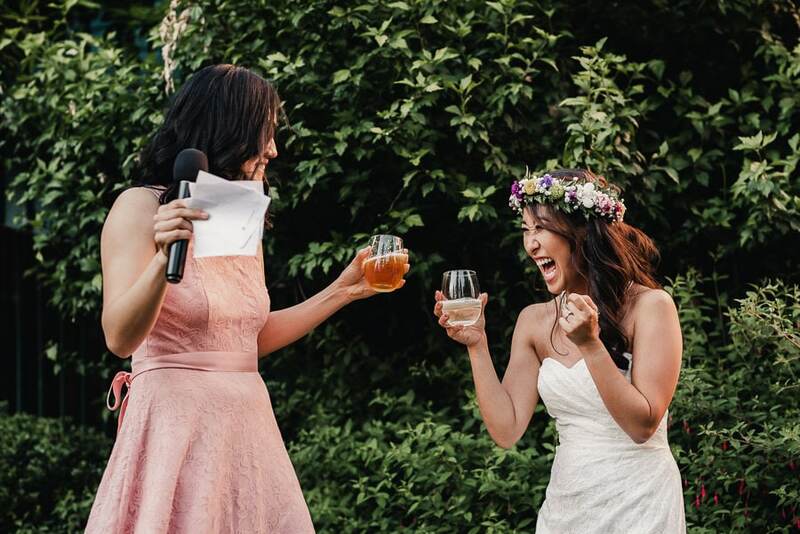 When photos are taken after the ceremony, participating in cocktail hour will be a significant challenge and guests will end up waiting around. 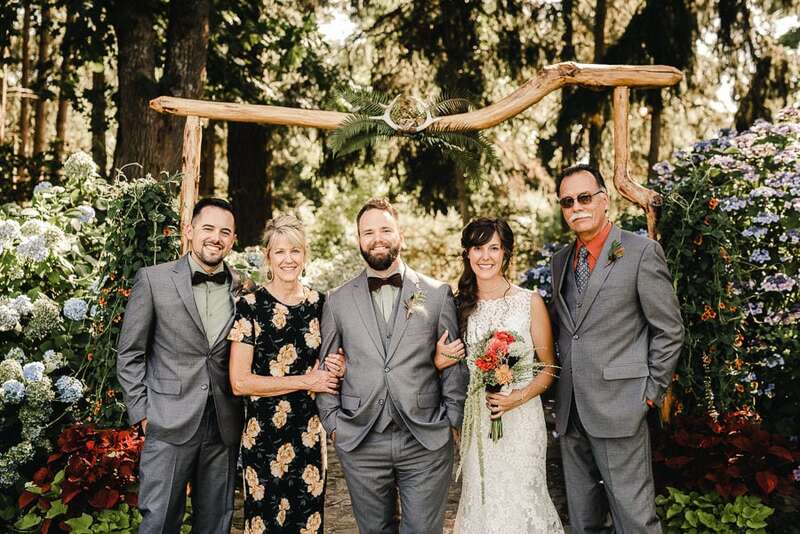 But if you’d prefer this more traditional route of seeing each other for the first time while walking down the aisle, it’s important to be very realistic about the time necessary to take family portraits, wedding party portraits and bride and groom portraits between the ceremony and reception. I recommend a minimum of an hour and a half, if not two hours in some circumstances. My general rule for outdoor ceremonies in the summer is planning it about three to four hours before sunset. This is late enough in the day for the sun to start its descent, which lends itself to better lighting scenarios. At this time, the heat of the day should be cooling off, too. It also provides enough time to get in your cocktail hour, dinner, speeches, and a sunset portrait session before it gets dark. By the time dusk settles in, you’ll be all set for the twinkle lights to come on and to get the dance party started. For me, photographing couples is about more than just taking pretty pictures of them. I want to facilitate a relaxed experience and environment for them to share meaningful words and authentically engage with each other. This is a time to potentially share a written note, give gifts, or exchange a more private set of vows. Additionally, I utilize a variety of prompts to get couple interacting and opening up in front of the camera. But it can take some time to get folks to loosen up. Having 45 minutes to stroll around before the ceremony is my preference. In the evening, I often incorporate a second much shorter session at sunset. 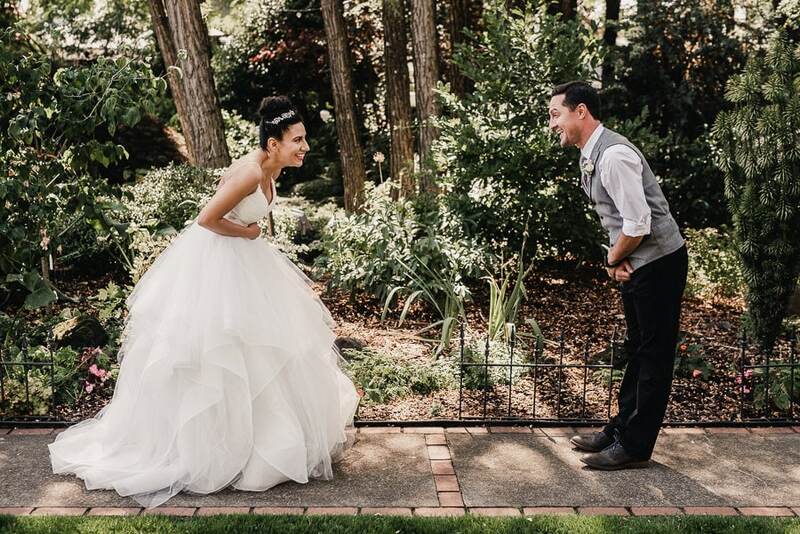 Portraits is also a time to stroll around the property and take a calming moment to share with your partner. 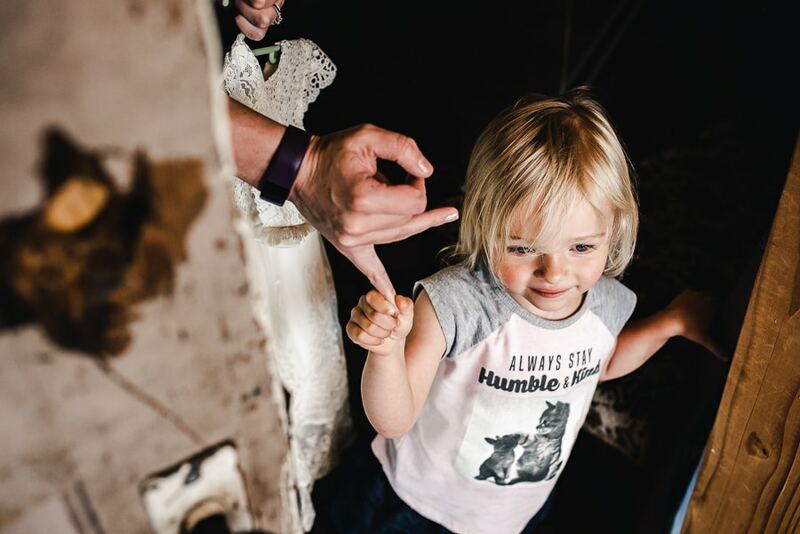 If you give yourself the time for an experience like this it will translate into authentic portraits that don’t feel staged. However, if this portrait time is truncated you may be worrying about making it to the next stage of your wedding, and you won’t feel fully present and in the moment. Allow yourself a space for a carefree portrait experience that’s not just about taking portraits. Cocktail hours are great! It’s the perfect time for your guests to loosen up and start socializing. From a timeline standpoint it really helps with the flow. During the cocktail hour it’s the perfect time to sign your marriage certificate now that you’re married. Family portraits can follow seamlessly. I recommend doing family portraits during the cocktail hour, as opposed to before the ceremony, so that you don’t run into the chance of a family member arriving late. It also breaks up the photo sessions so that your beautiful smile doesn’t get worn out. 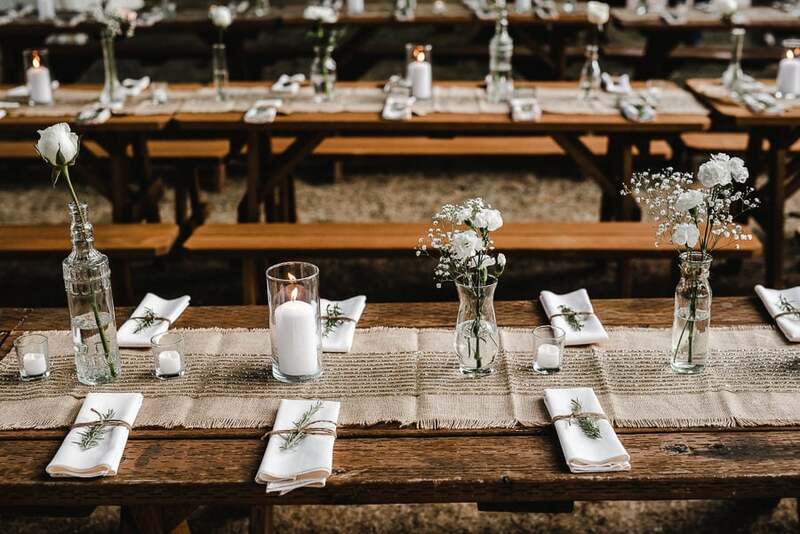 After signing you marriage license and taking family portraits, your guests will have made their way through the line at the bar and found their seats for dinner. This is the perfect opportunity to make your grand entrance and enjoy the tail end of cocktail hour. In 1948, renowned photojournalist W. Eugene Smith photographed the seminal photo story for Life Magazine called The Country Doctor. It was groundbreaking at the time because of the combined narrative impact of the images and how intimately close Smith got to his subjects. To achieve these results, for the first several days of his project he shot without film in his camera because he knew that those first images wouldn’t be any good, and he didn’t want to waste money on film. He had to wait until his subject, the country doctor, got comfortable with his presence with a camera and forgot he was even there. Wedding photographers don’t nearly have the time Smith had to put their subjects at ease so they can capture unique moments. But the same principle of having time to acclimate to a photographers presence applies. While 10 or even 12 hours for photography might seem excessive, a documentary approach does requirement a significant time investment to do it really well. I include this in the photography timeline because it’s important that your flowers arrive well before portraits begin. It gives an opportunity to photograph these details laid out nicely and ensures the flowers arrive on time for portraits. I’ve shot a few weddings when the flower delivery was overlooked. The florist delivered them closer to the ceremony and we had to do portraits without them. That was kind of a bummer. So be sure the florist knows to have the flowers delivered with some breathing room before the portraits kick off. This is another aspect to address with your vendors helping with setup. It is super handy if the reception is fully set up before the ceremony starts. If the reception setup is completed later it can be a challenge for the photographer. They would have to race to the reception area and get those detail shots before guests walk over and move things. If it’s not possible to complete the setup before the ceremony then guiding guests into a separate cocktail area can help. This will keep the reception tidy until the photographer has a chance to document it. I’m a big advocate for shooting most portraits before the ceremony, so it may come as a surprise that I encourage doing the family portraits afterward. One small reason, as I mentioned before, is to break up the portrait taking a bit. However, the big reason is to minimize X factors that have a good chance of creating a snag in the timeline. One of my main goals when creating a timeline is ensuring a high probability of starting your ceremony on time. If you do family photos before the ceremony, there is a strong possibility of a family members showing up late, especially with larger families. This happens more often than you’d think. There’s always that one family member who doesn’t take the timeline seriously or misses the memo entirely. Or perhaps they show up late because they have kids and have trouble getting them dressed in their cute dress or suit. Things happen. If you do family photos after the ceremony then the risk of someone arriving late and holding up the show has been eliminated. Usually, I knock them out in 30 minutes. The only drawback to doing family photos after the ceremony is the potential for your thirsty Uncle Tom disappearing off to the bar to grab a cocktail. Worst case scenario, we have someone wrangle him up. Pros and cons exist for everything scenario, but with good communication and careful planning this can be avoided. From time to time, I’ll work with a couple who wants to start speeches at the beginning of dinner. This could be thought of as a great way to kick things off with some entertaining words. But I recommend against it. If a long-winded talker takes the mic then your guests could end up enduring empty bellies. Either that or your guests will be in the buffet line distracted by food while speeches are going on. If you really want to start with speeches or a prayer, I recommend just one person with a set time limit. Reserve the rest of the speeches for the tail end of dinner when everyone is satiated and paying attention. The period of time about 45 minutes before and a half hour after sunset can results in magical lighting that helps create beautiful, dramatic portraits. It has a warmer quality then mid-day sun, and it’s lower in the sky. This helps light your face better. However, sunset can be hard to time sometimes. It can often fall right around the time when speeches are planned. Sometimes there are trees or hills that effectively make the sunset time earlier than originally expected. For this reason, it’s ideal to be a little flexible with the sunset portrait time, if it’s important to you. What this means is potentially pushing speeches or cake cutting by about 15 minutes if it’s critical to step out for the good lighting. At this point, your guests will be fed, happy, and chatting away, so they generally won’t mind if you’re missing for a short period. You’ll probably be thankful for an opportunity to duck out and cuddle with your partner while enjoying the romantic sunset. From a photography standpoint, the exact timing of the remaining reception events isn’t super important. Feel free to plan them with a flow that makes you most happy. There’s really no hard and fast rules here. But if it were my wedding, I would want to create a little space between events, such as the parent dances, cake, and bouquet toss. 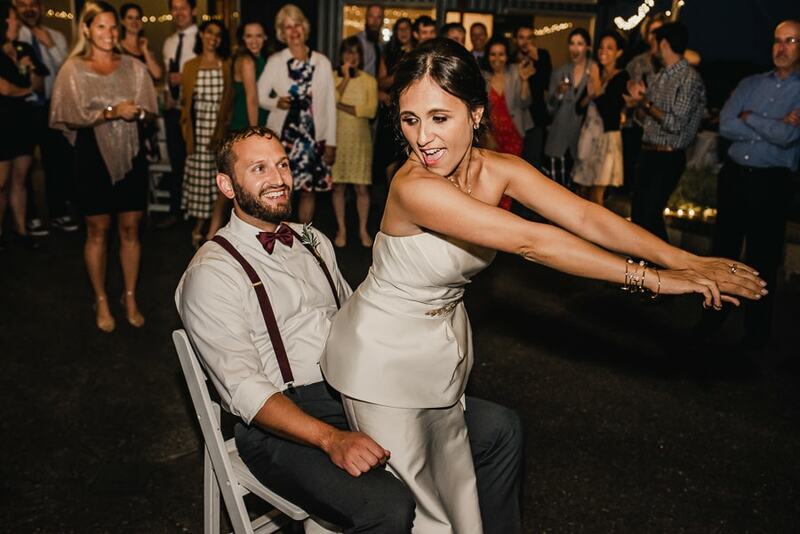 I find that doing so keeps more guests engaged throughout the reception. If all of the events happen at the beginning and then dancing commences for the remainder some guests who feel less inclined to dance may bow out early. In this event, fewer guests may remain for your exit if you’re planning one. But if you want to give guests such as grandparents an early opportunity to hit the hay, maybe knocking out everything early makes sense.